What is the minimum of necessary things to grow healthy aquatic plants? 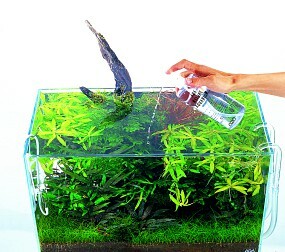 Substrate where aquatic plants spread their roots and lighting which supplies light to plants are crucial. Substrate built with ADA Aqua Soil-Amazonia and ADA Power Sand is the best for optimum growth of plants and also suitable for long-term maintenance of the aquarium. For a lighting system, ADA AQUASKY and the Solar series offer adequate light intensity. In addition to this, install a filter system for maintenance of good water quality and supply CO2 and liquid fertilizer to grow lush aquatic plants in a good condition. 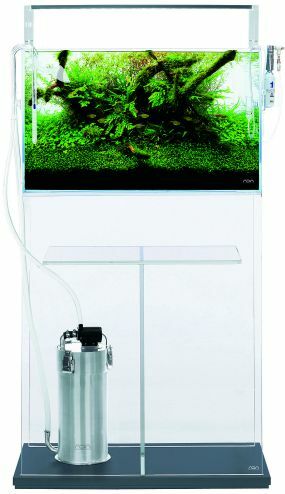 This is the full Nature Aquarium system for healthy growth of aquatic plants. A simple, sophisticated design is adopted throughout the entire system. 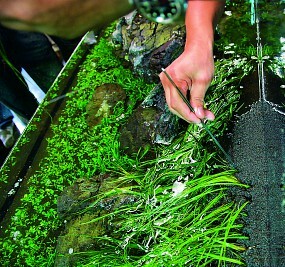 What type of tweezers is suitable to plant aquatic plants? ADA NA Pinsettes with an easy-to-handle length are suitable for planting aquatic plants. The ADA NA Pinsettes provide stress-free planting experience even in long hours. ADA Pinsettes L are recommended as your first tweezers. 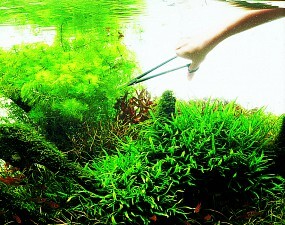 ADA Pro Pinsettes GRIP is ideal for planting of clump-type aquatic plants which are hard to hold such as Cryptocoryne. There are similar non-genuine tweezers on the market. However, you may not be able to hold aquatic plants properly with these tweezers due to tips not matching perfectly or excessively hard springs, which can result in damage to stem or roots of aquatic plants. 2. With ADA NA Pinsettes having perfectly matching tips, you can easily hold fine foreground plants and do the precise planting. What is an effective way of applying liquid fertilizers? It is effective to add liquid fertilizers, such as ADA Brighty K and ADA Green Brighty STEP 1, to the aquarium when turning on the aquarium light in the morning. When the light is turned on, aquatic plants start their photosynthesis and actively absorb nutrients. Adding liquid fertilizers for a few days’ dosage in one shot is not effective because nutrients may be oxidized or absorbed onto the filter media. Make it a habit to apply liquid fertilizer every morning for the good health of aquatic plants. ADA Brighty K supplies potassium crucial for the growth of aquatic plants. Apply ADA Brighty K daily and regularly. Can we maintain aquatic plants just by trimming them? Stem plants and foreground plants can be maintained for a certain period of time by repeated trimming (see the photos). 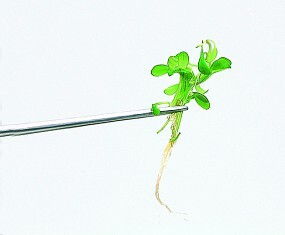 However, the plant´s stem and roots get old in the course of repeated trimming and this slows the formation of new buds. For this reason, it is necessary to pull the plants from the substrate and replant the young and healthy part of aquatic plants (i.e., upper part of the stem of stem plants). 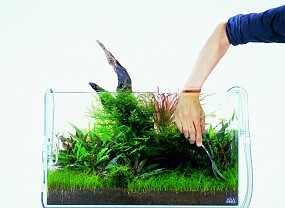 After the plants are removed from the substrate, add some new Aqua Soil. For shade plants such as ferns and Cryptocoryne, snip off the large old leaves to maintain them. Scissors with curved blades, such as ADA Pro Scissors Wave Type, are suitable for trimming foreground plants.